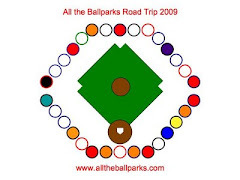 On July 5, 2009, we visited the Yogi Berra Museum on the Montclair University Campus in Montclair, New Jersey. I expected it to be a small museum and it is, but it is a surprisingly good one like the small Canadian Baseball Hall of Fame is. I really thought it would just be about Yogi Berra. That is the focus of the museum, however, it also gives the background history of the Yankees and to a lesser extent the Mets. In fact it is better than the Yankee Museum in the new Yankee Stadium. The museum visit begins with displays on the history of baseball in New York. It mostly focuses on the Yankees, but it does talk about the time period when their were three New York teams (Yankees, Dodgers, and Giants) and the Yankees prevailed as the only one that still is in New York today, as the Mets came later. This part of the museum also has a little history of catchers from the use of minimal protective gear to the more modern improved padding and helmets. Some of the Yankee history displays include one of the bats Joe DiMaggio used during his 56 game hitting streak, a Babe Ruth signed ball, and the original Mickey Mantle and Joe DiMaggio plaques from the old Yankee Stadium’s centerfield fence before the 1970s remodel. Intertwined with the Yankee history are parts about Yogi Berra, such as his growing up in St. Louis and his military service during World War II. Related to his playing career there are some his awards, such as MVP plaques and World Series rings. The bronzed glove worn by Yogi Berra when he caught Don Larsen’s perfect game in the 1956 World Series is one of the best items on display. Some of the most interesting stuff, though, is related to the more recent closing of the old Yankees and Mets stadiums, which Yogi Berra went to both of. It was interesting to learn his connection with both New York teams. He mostly played with the Yankees, but played a few games with the Mets a year or so after him being fired as the manager of the Yankees. He then had a managerial career with the Mets. Overall this is a great museum. It is not very big, but it does a lot more with its space than the Yankee Museum. If you want to go to a museum with Yankee history this is the place to go. Sure the Yankee Museum has all that World Series stuff, but this place still represents quite a few of the World Series along with the more general history of the team. Yogi Berra Museum is definitely a misleading name for the museum and really only refers to him owning it and starting it. It does tell about him as a player mostly has memorabilia related to him, but there really is way more to it and it is more of a New York baseball history museum. At the Boston Red Sox game we got a sticker with the Boston Red Sox logo with the red socks in the middle of the circle.Now that the Boston Red Sox sticker is on the American League side of the car that side is getting quite full. Only three more teams to see in the American League, so it is not like we need that much more space on this side. Good thing there are fewer American League teams than National League, as it seems a lot of the bigger stickers we ended up with are American League, especially the Seattle Mariners one. 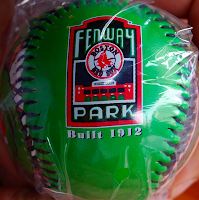 The second ball I got at Fenway is a Green Monster one. 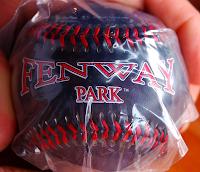 I mostly got it because it has a cool Fenway Park logo on one side of the green ball. The other side has Boston Red Sox B logo. The other strip has a view of the Green Monster along with a picture of the Green Monster mascot.